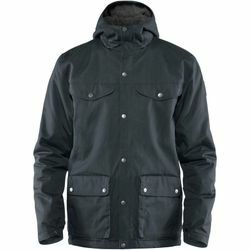 Fjallraven Greenland Winter Jacket. A 1970s classic that has warmed generations of nature lovers - now with an improved fit and sustainable materials. Weather-resistant outer fabric, soft teddy-fleece lining and practical details make for a winter jacket that is equally at home in the forest as in town. Its water resistant properties can be enhanced with Greenland Wax, which further increases the durability of an already long-lasting jacket.